There are so many complaints about the productions on YT that it is something of a surprise that no one seems to mind this one. It made no sense to me at all. It's like an archeology club that is digging up these people to stare at them for a while and then put them back into their display cases. Ick. It's supposed to be a young woman sailing around in a boat, maybe a bit hard to stage. I'd like to see someone try. In Santa Fe you actually are outside. Joyce is wonderful, and the other people are fine. 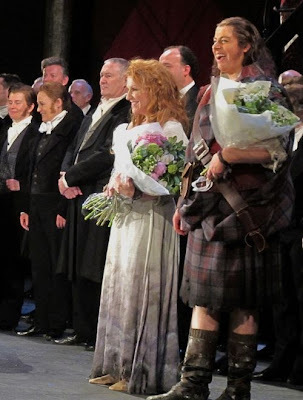 Daniela Barcellona is the largest person on the stage, dwarfing all the others, which makes her completely believable as Malcolm. If you can't go to Santa Fe, watch this. Here.